Sequence variation patterns along a latitudinal cline in Scots pine (Pinus sylvestris): signs of clinal adaptation? Adaptive clinal variation is abundant in nature, and its genetic basis is of great interest. The polygenic nature of this variation poses a challenge for identifying the causative loci underlying these adaptations. Here, we have examined the patterns of sequence variation in ten candidate genes for timing of bud set and cold tolerance, traits that form strong latitudinal clines in Scots pine (Pinus sylvestris). A set of reference genes was used for comparison and to infer a simplified demographic background model with approximate Bayesian computation methods. Against the resulting bottleneck model, the neutrality tests show little signs for local adaptation, but species-wide selection is suggested in some of the studied genes. In line with the theoretical expectations, we see little evidence for adaptive differentiation with F ST methods. Instead, allele frequency clines were found in three genes (dhn1, ftl2, and prr1). Our results add to the discussion on which molecular signals best characterize a gene subject to clinally varying selection. This will be especially relevant when these kinds of observations can be examined in parallel with association study results. The online version of this article (doi: 10.1007/s11295-012-0532-5) contains supplementary material, which is available to authorized users. 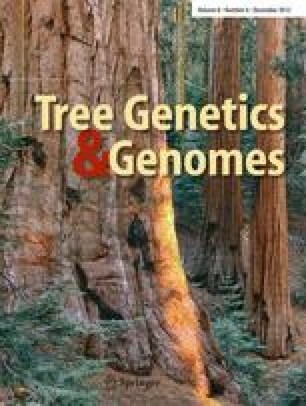 The authors want to thank Katri Kärkkäinen from the Finnish Forest Research Institute for providing seed material for most of the populations. The samples from Kaddekielas, Sweden, and Usinsk, Russia were kindly provided by Torgny Pärsson (Skogforsk, Sweden), the Italian sample by Giovanni Vendramin (National Research Council, Plant Genetic Institute, Italy) and Latvian sample by Aris Jansons (Latvian State Forestry Research Institute, Latvia). We would also like to thank Soile Alatalo, Hannele Parkkinen, Janita Ranta, and Katja Salminen for the laboratory work, Jaakko Tyrmi for helping with sequence submissions, and Stéphane De Mita for helping with ABC. We are also grateful to Martin Lascoux for the discussion on demographic inference. This research was supported by the EU Network of Excellence EVOLTREE (FP6 016322), the EU project NOVELTREE (FP7 211868), and Biocenter Oulu, Finland.